09:40 – 10:10 New EU data protection privacy laws – how will it affect Big Data Science? 11:20 – 11:50 From Medicine to Digital Medicine. Sit back, relax and enjoy the ride. Education Task GroupEASyM acts as a platform to acquire funding for events &training courses and to promote them internationally. If you are interested in becoming a Task Group member, join this session. 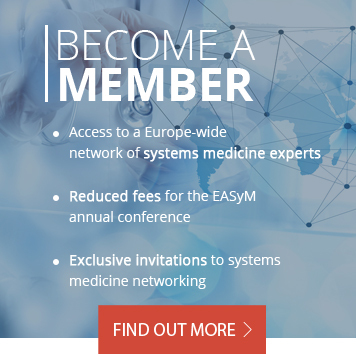 Communication Task GroupEASyM offers you the opportunity to share your insights about Systems Medicine with an international community. For younger members, this is a great way to practice your communication skills. If you are interested in becoming a Task Group member, join this session. *General Assembly – official part1. The annual report of the Executive Board2.